ABC brings on perfect summer fun with gears, sparks, and scrap. Last night saw the debut of ABC’s newest summer competition series, a revival of Comedy Central’s cult hit BattleBots (Sundays at 9:00PM ET). Revivals are always tricky, and it gets even muddier when it’s something as cult-ish as BattleBots. Luckily the network and producers found the perfect way to take what worked on cable in 2000 and make it bigger, more explosive, and more personal for 2015 and broadcast networks. There’s not much to the series that you can’t figure out by pictures or the title. Two robots fight each other to the metallic death in a season-long tournament. If no winner by a knockout or total destruction is found after three minutes, the judges will pick the winner. Traps all over the BattleBox like saws, wall screws, and giant hammers known as the Pulverizers make it extra tricky. The season’s champion takes home the giant nut and the cash prize. The one thing that worried us is that ABC made it clear the new series of BattleBots would be more personal, delving into the lives of the contestants and how they build the bots and their passion for it. We’ve seen this drag other shows with such potential, like Syfy’s Robot Combat League and so many other game shows, to a grinding hault. Luckily ABC’s series found a way to do this without getting distracting or in-the-way. We get to meet these people a bit but it never drags and does give some insight and emotion to each human competitor. Plus long time fans of BattleBots get to go down memory lane and meet some competitors and robots from the previous series. Speaking of that, kudos for ABC for not ignoring the history and cult fanaticism of BattleBots. They could have easily ignored the old Comedy Central series and moved on and no one (including us) would have complained, but little touches like showing old Comedy Central footage, or bringing back old robots and competitors, kept a level of continuity that rewarded fans of the series without leaving others in the dark. 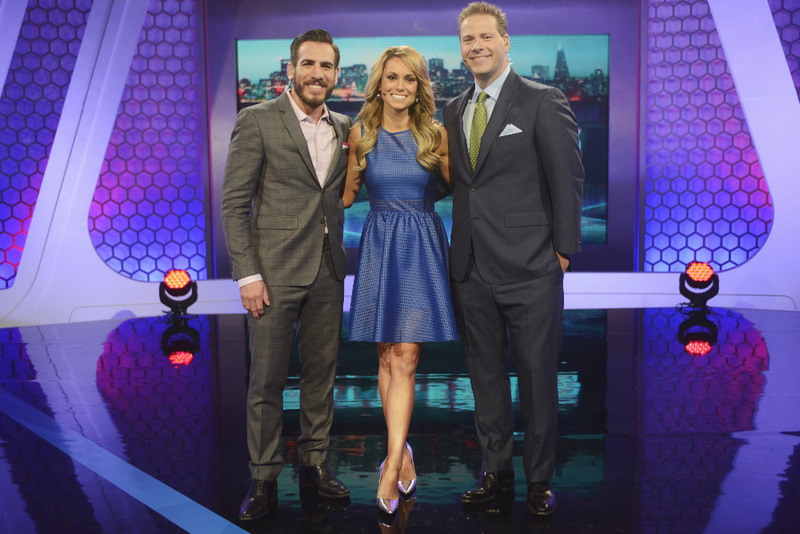 The hosting crew, mainly fronted by Chris Rose, Kenny Florian, and Molly McGrath, does a nice job of keeping it all inclusive. This series steers away from the comedy aspect of the old series and makes it more like an MMA or boxing match, and it works well. They don’t get too bogged down in the technical aspects of it but they take it seriously enough (without being too serious) to make it seem important. Plus it’s nice having the hosts down by the box this series to see their reaction to the carnage. The fights lived up to their potential. The first episode saw an ungodly amount of sparks, fire, robots literally torn to shreds, scrap flying around, and just utter chaos and destruction. The most interesting thing was seeing some old robots from previous series get crushed by newcomers. The new tech showed their strength yesterday and it’ll be interesting to see how it goes. It’s really hard to see how they could do much better beyond adding another fight in, but it never felt like it dragged. BattleBots seemed to get families around the television last night laughing, cheering, and screaming. It kept a good pace, it had a good tone, and it was a solidly produced, incredibly enjoyable hour that flew by, and I can’t wait to see next week’s episode. BattleBots airs Sundays at 9:00PM ET on ABC. Photos and video courtesy ABC. With fast paced and exciting action, a great hosting crew, and well-produced updates to bring the show to 2015, BattleBots is nearly perfect family entertainment. Watch: First Gameplay Footage of Boom!